Set up your account with a one month free trial - no charges for 30 days. Get the best of both worlds. Backup your ReadyNAS to the ReadyNAS Vault Cloud! We are natively available on most ReadyNAS devices. Need more space? Larger file sizes? Custom features? The first 30 days are free for all our subscriptions and you can upgrade, downgrade, or cancel at any time. Or, get started with a free forever 2GB account and see if you need more storage or functionalities. Want more details on our plans? See our full comparison table here. 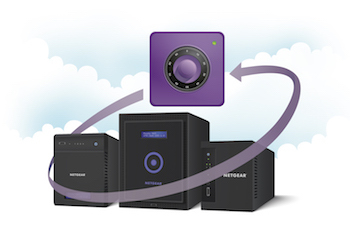 ReadyNAS Vault is natively integrated with NETGEAR ReadyNAS devices. No need for mapping the NAS to your computer! The Everywhere folder automatically syncs across devices. Start working at the office desktop, pickup where you left off from your laptop at home. ReadyNAS Vault backs up and syncs Windows (including servers) and Mac devices. Fast access from any browser – no software required to download your files. ReadyNAS Vault always encrypts data with AES 256-bit encryption before it even leaves your device! Transfer of the already encrypted data is also done using a 128-bit SSL secured channel. Share a folder with your colleagues - the changes that any of you make automatically sync to each others’ devices. No more carrying around thumb drives or emailing files around! Tired of emailing files or sharing them via thumb drives? Share files with your friends and colleagues with simple url links. You can even password protect the links! Ever deleted a file by mistake or to save space, only to realize that you need it? Use Archive control to keep copies of deleted files and folders. Wish you could go back in time and find an older version of a file? Now you can. All previous versions are easily identifiable with date and time.